SEATTLE (AP) - "Grande ego. 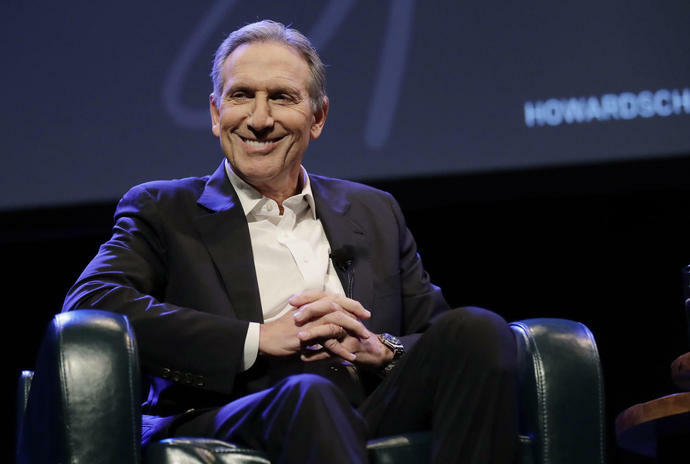 Venti mistake": That was the message protesters had for former Starbucks CEO Howard Schultz as he returned to his hometown of Seattle after announcing that he's mulling an independent run for president. Several dozen protesters gathered outside a downtown theater before Schultz appeared to promote his new book Thursday night. They included Democrats who fret his candidacy would hand President Donald Trump another term, and green-and-gold-bedecked basketball fans who haven't forgiven him for selling the Seattle SuperSonics to a group that moved the team to Oklahoma City more than a decade ago. The protesters outside his talk Thursday chanted: "Pick a party." Some carried signs decorated like Starbucks cups that read "Compost your campaign" and "Grande ego. Venti mistake" - a reference to the Italian names for drink sizes at the coffee chain. The crowd was more muted when Schultz explained away his voting record - he's cast a ballot in just 11 of 38 state, federal and local elections since 2005, as The Seattle Times first reported. He said he has voted in every presidential election since he turned 18, but otherwise said he simply hasn't been engaged in local politics. "I was so focused on getting myself and others out of a money-losing situation that I made a bad choice and failed to follow a principle that helped me grow Starbucks, which is to try to balance profit with humanity," he wrote in The Seattle Times. "Selling the Sonics is the biggest regret of my professional life." Some Sonics fans considered the apology long overdue - not to mention suspect, given that it coincided with the announcement of his presidential musings.